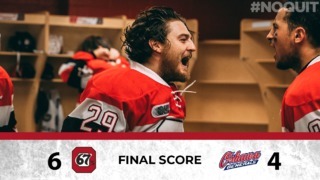 The big battle of the Bitten brothers got cranked up a notch Sunday night as Sam Bitten scored the winner to power the Ottawa 67’s past the Hamilton Bulldogs 5-4 and even the best-of-seven series at a game apiece. 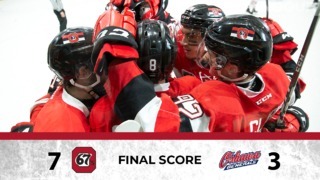 Sam, brother of Bulldogs’ forward Will Bitten, broke a 4-4 tie with two minutes to play to earn his 67’s a key split on the road with the series now moving to Ottawa for games three and four. Shaw Boomhower also had a pair of goals to lead the eighth seed 67’s past the Eastern Conference champion Bulldogs in this one, while defenceman Noel Hoefenmayer continued his impressive start to the series with three assists. This was a game that was up for grabs all night long and Ottawa wasn’t about to let it slip away. After falling behind by a goal early in the first period, Ottawa responded with an energetic second that generated the tying goal. Midway through the middle frame, Boomhower tipped home a shot by Nikita Okhotyuk to even things up at a goal apiece. The 67’s would strike again early in the third period with Boomhower putting the visitors ahead with his second of the game, only to have the Bulldogs tie things up a short time later. But goals by Sasha Chmelevski and captain Travis Barron less than two minutes apart put Ottawa up by a pair, setting up Bitten’s late-game heroics. 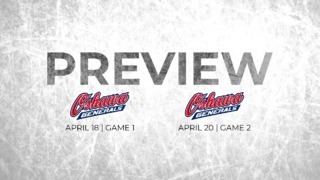 With the series all even at a game apiece, the 67’s will now welcome the Bulldogs to the Arena at TD Place for games 3 and 4 on Tuesday and Wednesday nights, respectively. With three assists on Sunday, defenceman Noel Hoefenmayer now has six points through Ottawa’s first two playoff games and consecutive three-point games. Sunday marked Shaw Boomhower’s first career multi-goal playoff game. Ottawa went 1-for-3 on the powerplay, while Hamilton went 1-for-4. Olivier Tremblay made 31 saves to earn the win for Ottawa. Ottawa’s Kody Clark and Jacob Cascagnette led both teams with five shots each.